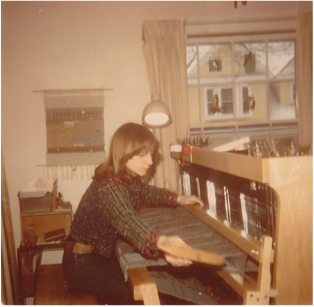 1974 ~ When the loom was new and I was young, and able to weave a 3-block double cloth wool rug at full width of 56". This Macomber loom (B4E 848) and I have been together for miles and miles of yardage and projects. It was built for me in 1973 when Macomber was still in Saugus, Massachusetts. It’s in great working order but sadly I am not. This large loom needs a new home quickly so I can bring in a smaller Macomber and weave again. Reduced for quick sale $2800- or best offer, serious inquiries only please.